ah, it seems like only yesterday that the bean was riding around town in an itty-bitty, oh-so-portable infant carseat. 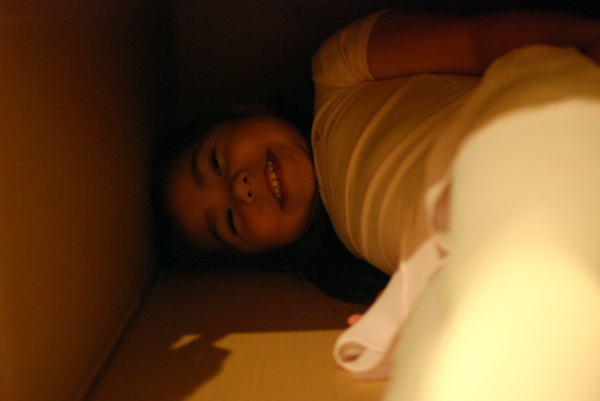 and then when she outgrew it, we moved her up into a regular convertible seat. when she was about a year and a half old, we finally turned the seat around so she could actually see where she was going. 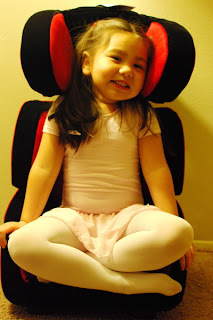 amazingly, she's now outgrown this seat! i can hardly believe it. we've had some good times in this thing, and it's yet another piece of her babyhood that it's time to leave behind. damn. i wish she'd slow it down a little...i'm just not ready for her to be such a big girl. one of MIL's parting gifts to us was to have me place the order for the bean's new seat - a big girl booster seat that will take her all the way through until she can ride in the car with just a seat belt. 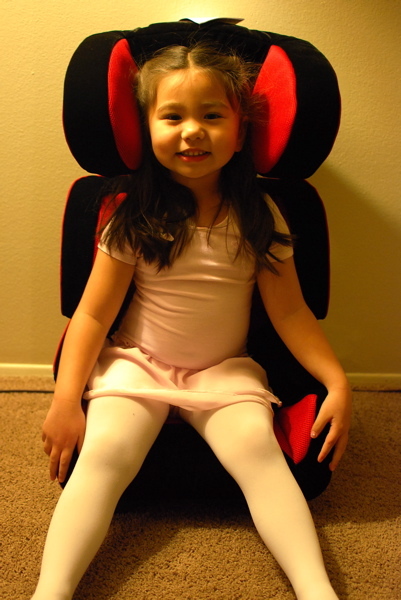 and in california, the law was just revised to require a booster seat for kids either 4'9" or 8 years old. EIGHT! yikes. 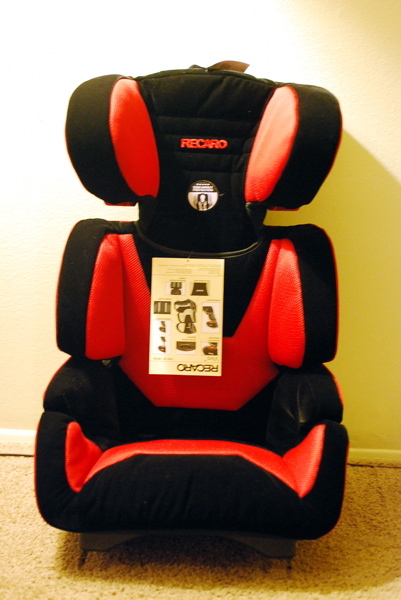 after doing research on several sites, i settled on a nice, plush-looking seat by recaro. yup, the company that designs seats for race cars and airplanes. 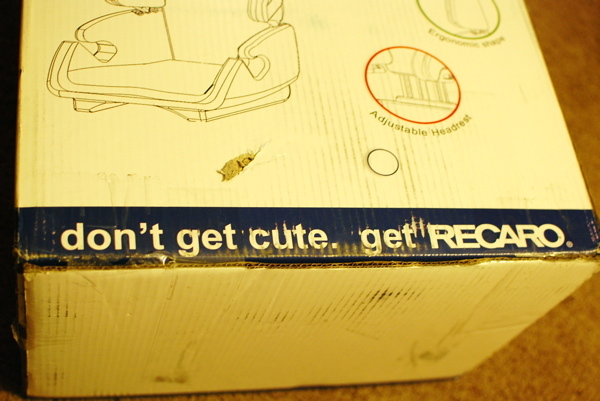 it got some great reviews, and it looks comfy. plus, i managed to find it on sale with free shipping. can't beat that. the bean was super excited to finally get out of the baby seat that she'd been complaining about for a few weeks. and rightly so, since she was most definitely too big for the damn thing. 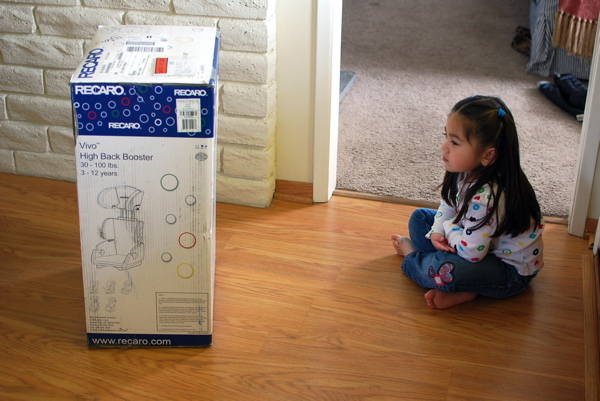 every day she'd ask me "mommy, is my new car seat here yet?" and yesterday, i was finally able to tell her "yes, it's going to be here today!" when we got back from school, a post-it on the mailbox told me to go into the side yard for the much-anticipated delivery. and when i brought it in, she totally squealed and came over to inspect it. 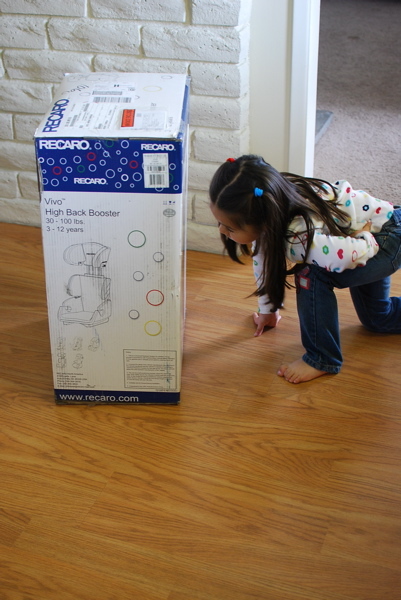 then she sat down and worshiped it for a few minutes. it was easy enough to snap the two pieces together. pretty snazzy looking seat, eh? 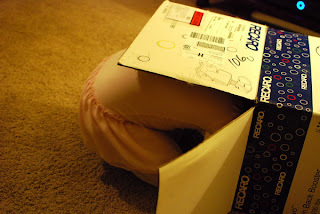 she clambered out of the box and plopped right in. "oooh, it's so soft and comfy, mommy!" she said. i'm pretty excited that now we can move it from one car to another without the hub breaking his back to tighten it to his standards. i could never get it in there properly, and this buckles into the seat using the regular seat belt. because obviously, i usually DO opt for cute. heh. If the law was going only by height, then I wouldn't meet the height limit by just an inch and would need my own booster chair. lolol. I'm 4'10"! 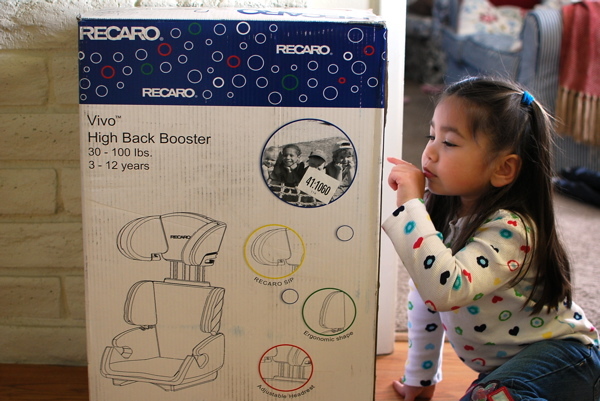 mh was so impressed that recaro makes baby seats. it's the only reason he would consider spawning at this point. oh, and the way we found out: we searched "pur" (as in water filters) on BB&B's site, and it brought up the pur replacement filters...and every recaro seat they have in stock.